For adding keyless remote entry and panic functions to an existing access control system or as part of a new radio-based system, Linear offers the MDT series. These handheld transmitters are compatible with all Linear access receivers and controllers. 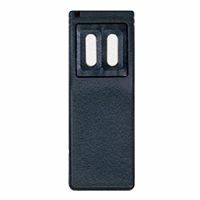 They are a safe, convenient form of door, gate, or gate and door control and are ideal for handicapped access. At sites like campuses and parking garages, where extra security is needed, multi-channel models can be used as panic buttons to summon help. One-, three-, and five-channel models are available. Each is lithium battery powered and supplied with a metal clip for convenient attachment to a vehicle visor. A proprietary pulse position format results in an extended transmission range. The MDT-2AB three-channel model sends a unique code when either of the front buttons or top button is pressed. It is for applications where three separate access points are controlled or for combining keyless entry and panic functions. All three models are MegaCode format, which means each transmitter is factory preprogrammed with one of over 1,000,000 codes, virtually eliminating the possibility of code duplication. Because the receiver “learns” each of specific code, no unauthorized person can gain access to the system by reprogramming a transmitter. Because there are no dip switches, the code cannot be changed. Block coding is also available, to save the time required for each transmitter to be individually learned. When used with a Linear access controller, all of these transmitters can be locally or remotely programmed into memory by entering the first and last codes of the block into the system. Facility codes can be selected to further customize the system. All transmitter code data is stored in no-volatile EEPROM. Data is retained in excess of 10 years, even if battery power runs out.